There’s something special about the light here. Find out why artists from around the world are drawn to one of America’s first artist colonies: Gloucester’s Rocky Neck. Stroll through artist galleries and studios nestled on this Cape Ann peninsula. Talk to the artists and watch them work. Grab lunch on the water overlooking a working fishing harbor. Rocky Neck is one of America’s oldest art colonies, supporting an impressive number of year-round working artists. The district is home to numerous galleries and restaurants as well as the critically acclaimed Gloucester Theatre Company. 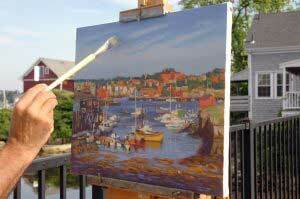 Venues offer a calendar of special events like Nights on the Neck and the Rocky Neck Artist Ball. A dynamic new cultural and visitor center is also in the works.